One of the difficulties of motion lights is that they generally don’t play nicely with CFL bulbs. This socket by American Tack is an exception, which makes it an excellent choice for those who put energy efficiency as a priority. With a compact fluorescent bulb in addition to the motion sensor, this socket becomes an excellent choice for those off the grid. It can be used indoor or outdoor, and would be an excellent way to make sure those pantry/garage lights get turned off. It accepts CFL, incandescent floodlights, and halogen, up to 150 watts, which gives you a lot of flexibility. 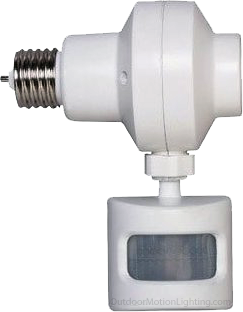 The sensor is effective to 30 feet with a 180° detection radius, and the orientation is fully adjustable. The light will stay on for 10 minutes after the last motion is detected. This is a relatively new unit on the market. Some thought seems to have gone into its manufacture, but if you are looking for something cheaper, or more proven, you may prefer this First Alert motion sensor socket. Amazon sells the American Tack (Hemco) OMLC3BC Outdoor Motion Activated Light Control for around $20.